MORGAN HILL —The Wineries of Santa Clara Valley are ramping up to compete in multiple competitions after their best year yet. Santa Clara wineries were recognized for their collection of quality wines in 2018, participating in the SF Chronicle Wine Competition, Orange County’s Commercial Wine Competition, the California State Fair, Tasters Guild, Beverage Tasting Institute, the Sommelier Challenge International Wine Competition, the Monterey International Wine Competition, the Sunset International Wine Competition and Rose Today’s competition. The valley walked away from 2018 with more awards to add to its repertoire. The highlights for the year included Alara Cellars, who took home Best of Show, Best White Wine, Best of Class and a Double Gold for their 2017 Grenache Blanc. Sarah’s Vineyard received Top Pinot of 2018 by Wine Spectacular for its Pinot Noir. Collectively, the wineries racked up 12 Double Gold Medals, 33 Gold Medals, 57 Silver Medals and 44 Bronze Medals. As for Wine Enthusiast ratings, there were more than 25 entries that scored over 90 points and two entries that scored 95 points or more. The Wineries of Santa Clara Valley is an association representing member wineries that grow and produce wines in one of the oldest wine producing regions of California. With the first plantings at the Santa Clara Mission in 1798, the region of Santa Clara Valley represents one of the oldest growing traditions in the country. The Santa Clara Valley is now home to over three dozen wineries, of every size and shape, from long-established family operations to relatively small newcomers. On March 28, 1989, the Santa Clara Valley received AVA status; prior to this the region’s wines were typically labeled ‘Central Coast’ or ‘Santa Clara County’. FORT WORTH, Texas (PRWEB) – The Botanical Research Institute of Texas (BRIT®) is pleased to announce Casa Ferreirinha, a Portuguese reference brand in Douro Wines, as its platinum medal winner in BRIT’s 2019 International Award of Excellence in Sustainable Winegrowing competition. Casa Ferreirinha topped the field this year based on the winery’s ongoing sustainable programs that address both the three key factors of sustainability – environmental, economic, and social aspects — as well as superior wine taste. Five additional wineries – two from the U.S., two from Italy, and one from Portugal, also won awards based on their strong sustainable programs. Casa Ferreirinha’s current sustainability accomplishments include: vineyard certification by the International Organization of Biological Control (IOBC) Integrated Production (IP) standards; growing floristic biodiversity as a means of promoting natural enemies of grapevine pests like the grape moth; preservation of indigenous grapevine varieties like the Touriga Nacional; use of renewable energy (hydro, wind, and solar); aggressive short-term plan for reduction in CO2e emissions; and education, medical, and insurance programs available to its workforce. The vineyard has been working towards this award for almost a decade. In 2009, Casa Ferrreirinha was a founding member of the Portuguese Association for Grapevine Diversity (PORVID), a non-profit association promoting biodiversity and managing the preservation of indigenous grapevine varieties like the Touriga Nacional. Casa Ferreirinha is a pioneer brand in the production of Douro Wines. 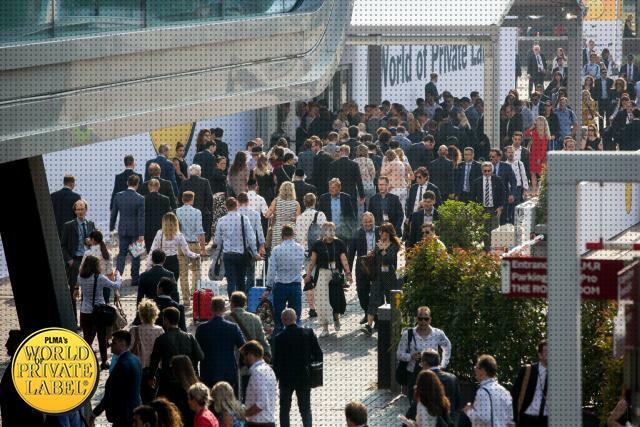 Innovation married with tradition, as well as the profound knowledge of the Douro Region, are the guarantee of exceptional wines such as Vinha Grande, Quinta da Leda, Callabriga and Barca Velha. E. & J. Gallo Winery, Modesto, California. Submitted J Vineyards Pinot Noir 2016. Gallo receives special recognition for its corporate-wide, multi-brand sustainability programs and for the organization’s industry leadership. Presentation of the platinum award to Casa Ferreirinha will be made in Fort Worth on Wednesday, April 17, 2019 during BRIT’s Vine to Table dinner and auction fundraising event. NEW YORK,/PRNewswire/ — American shoppers, who may be enjoying more wines than ever before, need look no further than their supermarket to find quality wines that cost a-third less than similar bottles from the country’s biggest wine producers, according to the Private Label Manufacturers Association. And what better time to get those savings with the holidays here? Siegel’s point: European supermarkets have sold private label wines for years, to both critical and consumer acclaim. Tesco, one of Britain’s biggest grocery chains, won more than 140 medals for its wines at the 2018 International Wine Challenge, while labels from discounter Aldi – costing an average of just $7 each – won 43 medals at a previous wine challenge. It’s more than speculation: Whole Foods Markets introduced their Sommelier Selects program last year featuring seasonal wine recommendations under its own labels along with suggested food pairings by the retailer’s Master Sommelier. And this year, Walmart launched its curated Winemakers Selection label at very popular prices, with wines that are curated from many of the best wine regions of the world. These are all wines offered under the retailer’s name, just like their other store brand foods and household products, and many retailer wine programs here in the U.S. have had international success. Bottles from Costco, Trader Joe’s, and Aldi were honored at the Private Label Manufacturers Association’s 2018 International Salute to Excellence Awards, which reviewed more than 300 wines from 39 supermarket chains in 13 countries. The judges, who included Masters of Wine, sommeliers, wine writers, and retail industry professionals, gave awards to a $9 chardonnay from Aldi, a $10 sparkling wine from Trader Joe’s, and a $22 cabernet sauvignon from Costco. Think of all the holiday celebrations that would be that much more enjoyable if shoppers would worry a lot less about what to drink at a time when value is even more important, given the tangle of gift lists, party demands, and stretched-to-the-limit budgets. 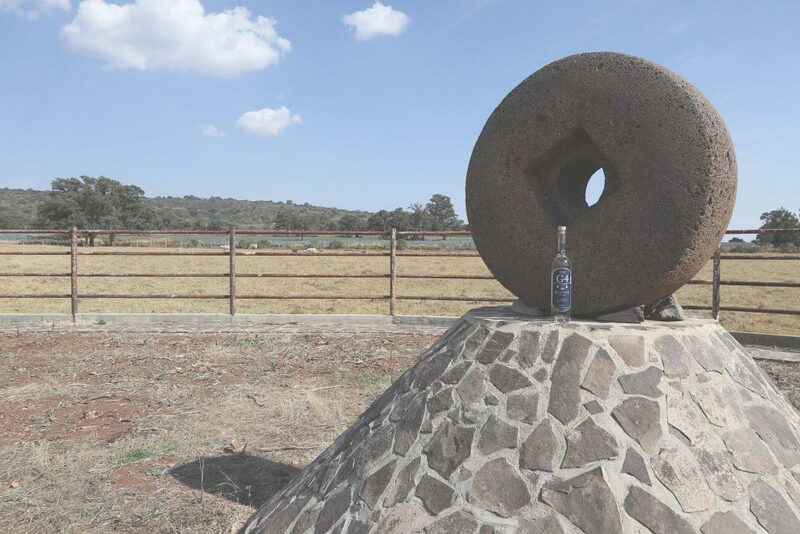 JESÚS MARÍA, Mexico /PRNewswire/ — TasteTequila recently ranked the El Pandillo distillery (http://g4tequila.life/) as number one in its exclusive tracking of all tequila producers. The designation was based on the ratings from over 41,800 different consumers and tequila judges using the Tequila Matchmaker mobile app. The family-owned distillery at El Pandillo placed at the head of over 129 active tequila distilleries currently operating in Mexico. Makers of the premium G4 Tequila, El Pandillo recently launched distribution into the U.S. and the brand is the buzz of the tequila business nationwide. Owner and operator Felipe Camarena hails from a family line of great tequila makers, transforming his passion for making great tequila into an art. Camarena’s engineering background was strategically applied to perfecting his line of pure, luxury tequilas. The name G4 simply represents the 4th generation of Felipe’s line of the Camarena family. Camarena honored the traditions behind tequila making while adding his own unique twists: using harvested rainwater and specially modified copper stills, 100 percent pure Blue Agave from their own family farm, modified stone ovens, and an entirely unique mechanical alternative to the traditional stone tahona used to crush the cooked agave. Numerous proprietary processes eliminate any bitter notes in the flavor, producing a smooth, perfect taste. Number One Distillery in the World: TasteTequila.com. Gold Medals from the Beverly Hills Spirits Competition. Best in Category and Best Agave Spirit at Spirits of Mexico. Best in Show at the WSWA industry event in Las Vegas. Platinum Medals and Best in Show by Tequila Aficionado. Learn more about the El Pandillo distillery here. The pinnacle of craftsmanship, G4 Tequila is the premium product of four generations of tequila mastery. Producers of the eponymous G4 Tequila, the distillery is well known for meticulous craftsmanship and attention to excellence. Previously unavailable in the U.S., G4 has begun distributing in an impressive 30-state rollout over 2018. Learn more about G4 at: www.G4Tequila.life. FORT BRAGG, Calif. (PRWEB) – North Coast Brewing Company, an independent craft brewery producing exceptional, high-quality beers, is excited to announce that its Old Rasputin Russian Imperial Stout has been awarded a gold medal at the Tastings.com World Beer Championships. Tastings.com judges described Old Rasputin as “a craveable hoppy imperial stout that is superbly balanced,” rewarding it with a ranking of 94 points and a gold medal at the Tastings.com World Beer Championships. Internationally recognized, the Tastings.com World Beer Championships is America’s oldest annual international beer competition, dating back to 1994. The World Beer Championships reviews a different beer category each month, using feedback provided from an exceptional panel of judges with expertise in categories such as beer retail, production, distribution and taste. Beers are blind tasted and judged on a 100-point scale, providing the highest level of control to guarantee beer fans with top quality reviews. Rooted in history, Old Rasputin is one of North Coast Brewing’s most famous brews, nationally recognized within the craft beer industry. Featuring a remarkable mix of rich flavor elements and a warming finish, Old Rasputin is a timeless take on an imperial stout. Old Rasputin is an internationally distributed beer and can be found locally using North Coast Brewing Company’s beer locator. Founded in 1988, North Coast Brewing Company is an independent craft brewery producing exceptional, award-winning beers in Fort Bragg, CA. North Coast Brewing crafts a wide range of beers, including barrel-aged ales and popular seasonal offerings, including a Berliner Weisse series, to 48 U.S. states and internationally. A pioneer in the brewing community, North Coast Brewing Company is focused on sustainability and is a Certified B Corporation, California Benefit Corporation and Best for the World 2018 Changemaker honoree. For more information on North Coast Brewing, please visit: https://northcoastbrewing.com/. My husband Eddie and I spending a day wine tasting in Santa Clarita (SCV) is not news. But wine tasting at two different vineyards within ten minutes of our house in SCV is. Chris and Jeannie Carpenter of Newhall have a cellar I have long coveted. Free standing and temperature controlled, with an attached sitting room, it is normally filled with exceptional wine. But on this day it was also filled with oak barrels to sample from and a “wine thief” (think classy turkey baster) to sample with. 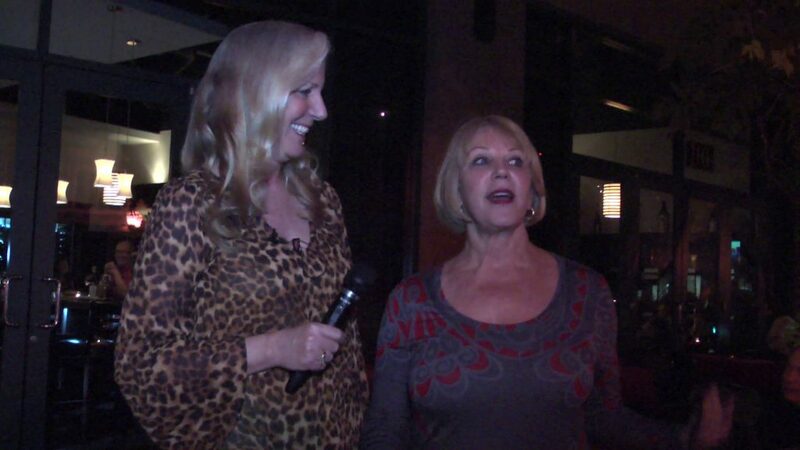 Me interviewing Jeannie Carpenter, a few years after this article was written. She then introduced us to her brother-in-law, Tim Carpenter, who had named the “Compa Vineyards” in memory of his dog, who was lovingly seen as a true “compadre”. “You can come back for the grape stomp,” Chris added. “We may do that next time. Until then we let the grapes drop, to give structure to our 2009 harvest.” We’re there. Then, back in the car, we drove ten minutes to Two Hearts Vineyard, this time into the hills above Hasley Canyon and to the beautiful home of Kerry and Susie (not Suzie Q.) Clark. And, even though they were in the midst of preparing for a wedding, it didn’t prevent them from being gracious hosts to an impromptu wine tasting. With a 4 year old all organic vineyard they have just a bit over 200 vines. Growing Rhone reds, Primitivo, Cabernet and Barbera; whites include Colombard, Viognier, Grenache Blanc, Marsanne and White Malvasia. “There were over 4,300 entries from 6 different countries making it the largest wine competition of any kind – commercial or amateur – in North America. Our 2006 Cat Canyon Santa Barbara County Sangiovese won a gold medal and the 06 Sangio-Cab blend took a silver. The 2006 and 2007 Gruner-Veltliner both took gold medals and the 07 Viognier got a silver. Our wines have won awards at other competitions including the California State Fair and the L.A. Cellarmasters U.S. Winemaking Competition”. “We enjoy the competitions as professional judges give us feedback on our wines”. It was a hell of a tasting. I had a hard time pouring out any of the wines Kerry had us taste. But the warm weather, excellent learning experience along with the subtle cheeses, fruits and meats, all increased our pairing experience. “I enjoy writing the labels,” Kerry said. “I think every wine has a story to tell. My labels help tell the story of what’s in the bottle. Wine should be fun!” My husband read one of his quips, “Be a mellow fellow – drink Bordello Verdello” on the 2006 Mullaro Creek and “GRU-V” the 2006 Gruner Veltliner. 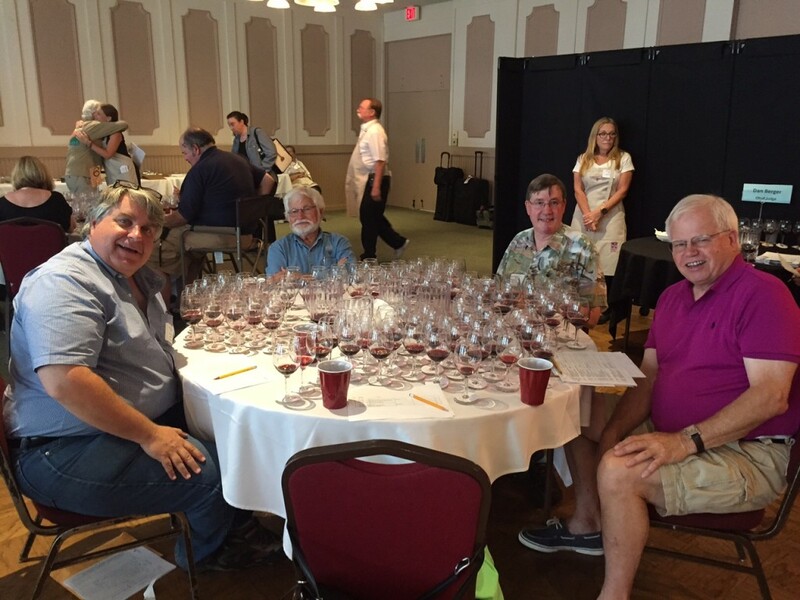 I was a little fretful…panicked is actually the right word, about judging the Long Beach Grand Cru for two days after only serving as a guest judge in the LA Wine Competition two years ago…once. I recognized the names of some of the judges, and personally knew quite a few, but I thought I better up my game and do some research. The panel I was assigned to was led by David Stevens (Senior Wine Consultant, Davon International), and included Joe Hart (Hart Winery), Mike Stepanovich (Wine Journalist, Bakersfield, CA.) and Stephen H. Young (graduate of the American Wine Society Wine Judge Certification Program). These knowledgeable gentleman, and the wine, made my nervousness fall away pretty quickly. Soon we were moving at a good pace. At the end of each round we discussed our findings and came to a consensus if a wine received no medal, bronze, silver or gold. There was so much thought and consideration in awarding each medal if made me pause, how often do you pause and consider buying a wine based on a medal? As much as you do a wine with a high numerical score? You are doing wineries a disservice to only consider one ranking body, in my now-educated opinion. Each panel, there were 26 judges in all, had nearly 100 wines to judge on the first day, about half that they second, and finally did a round of sweepstakes “sweeps” to determine which of the Gold medals were all-around favorites of all the judges. Many of the entries and winners came from small producers outside of California. There was a distinct level of camaraderie amongst the judges as some had been doing the Long Beach Grand Cru competition for 20+ years. It was an honor to join them that I hope to repeat annually. Day one closed with a wonderful dinner and unlimited wine tasting (wines from the day and more) at Parker’s Lighthouse. Our private room was full and during the first hour or so many of the judges, Long Beach Grand Cru Board of Director members and volunteers spilled out into the patio for a view of the Queen Mary. It was then that a tall gentleman wearing a cowboy slipped a bottled of wine from Stolpman Vineyards onto the tasting table. It took me about a nanosecond to figure out who that was. Tom Stolpman is also on the Board of Directors. A second after that I learned that he met fellow board member, James McAdams, in law school in the 70s and the two practiced in the same Long Beach firm. Tom Stolpman commented that we need to reach out and help others by serving in city council, etc., as that helps the common good and that equals legal aid. “At the end of the day the message of tonight is that we all walk out of here thinking that we are doing better and maybe not enough. Thank you for feeling that.” It was a sobering thought. L to R Top Row: Danny Ronen, Paul Ellis, Cassandra Brown, David Glancy MS, Roger Bohmrich MW. L to R Bottom Row: Cami Sisk MS, Chairwoman of the Judges Panel Deborah Parker Wong, Eve Bushman, Stacie Hunt. The 3-day judging process for the diverse and specific wine categories began with a 100% blind tasting preliminary round, with the best wines advancing to the Sweepstakes Rounds, where the Double Gold and The Best of Show Categories were awarded. “​Our expert judges are pleased to announce the 2018 Global Wine Awards winners who all represent excellence in winemaking skills and superior presentation from all around the world. The wines were judged based on varietal expression, uniqueness in character and approachability​” ​said Eddie Rivkin, CEO/Executive Director of Global Wine Awards. 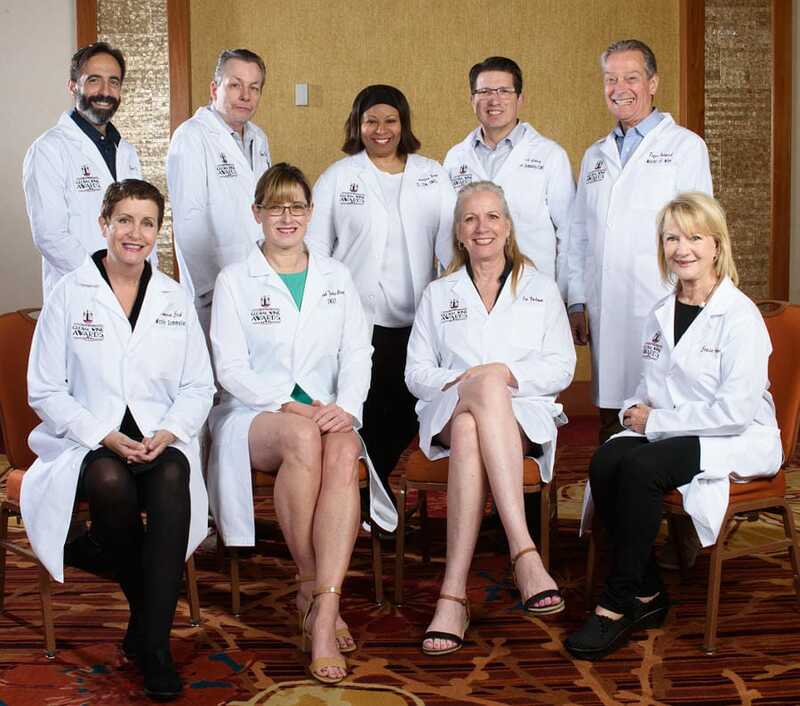 ​“​Las Vegas is an entertainment destination known globally for its vibrant wine culture, its fine-dining restaurants and celebrity chefs.​ ​It was the perfect paring to our first annual event.​” ​he said. Wines of Greece,​ ​HELEXO WINERY RETSINA White, RETSINA white, 2016, 96The prestigious judges, encompassing years of expertise, passion and credibility in the wine industry, featured:​ ​Deborah Parker Wong​, Global Wine Chairwoman and Editor for SOMM Journal and The Tasting;​ ​David Glancy​, Master Sommelier & CWE, Founder & CEO of San Francisco Wine School, the largest wine school in the USA; ​Cameron Sisk​, Master Sommelier, with thirty-five years in restaurants;​ ​Cassandra M. Brown​, Certified Sommelier from the Court of Master Sommeliers, and Certified Specialist of Wine from the Society of Wine Educators; ​Stacie Hunt​, Certified Silver Pin Sommelier /North American Sommelier Association and Vice President of the Board of the National Association of Wine Retailers;​ ​Paul R. Ellis​, Sommelier at Rao’s, Caesars Palace;​ ​Eve Bushman​, Level Two Intermediate Certification from the Wine and Spirits Education Trust (WSET), a “certification in first globally-recognized course” as an American Wine Specialist ® from the North American Sommelier Association (NASA); ​Roger Bohmrich​, Master of Wine, independent consultant, writer, and educator; and ​D​ä​nny Ronen​, educator in spirit and cocktail development. During the awards competition, all the wines, in their respective and specific sub-categories, were sampled together as flights, carefully evaluated in all aspects, and scored by each one of the skilled judges.​ ​All winners received industry acknowledgment and a distinguished medal of recognition. Eddie Rivkin CEO/Executive Director of Global Wine Awards and Global Spirits Awards hosts the events from the entertainment capital of the world, Las Vegas, Nevada. For more information and a complete list of judges bios, photos and winners, visit the website at ​www.GlobalWineAwards.co​. Follow on Instagram at Globalwineawardslv. How Did We Judge the First Global Wine Awards? Nine judges in total, one Executive Director, a local restaurant sommelier, professional photographer and attentive servers = our first meeting in Cohiba Room three at the Tropicana Las Vegas, while avoiding rooms one and two as they held all of the wine that we were very anxious to judge…blind. 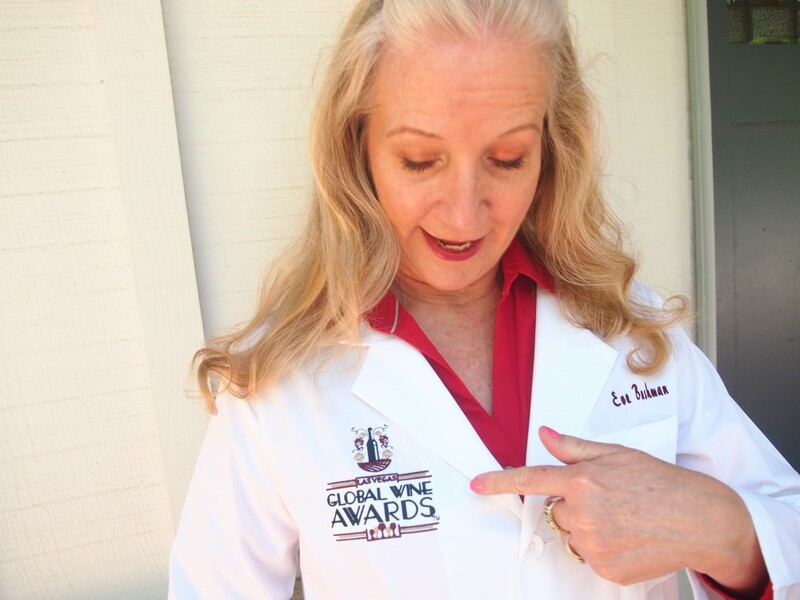 Donning my first wine judge lab coat! Welcome to the inaugural Global Wine Awards in Las Vegas! Deborah Parker Wong (Tasting Panel, Somm Journal and the Clever Root. See all of the judges bios here) was consulted by Exec. Dir. Eddie Rivkin and then had our entire preliminary round set up to begin the first day. On the second day we would do the “sweepstakes” round, where we would decide which of the Gold medal awarded wines would be our choice for any Double Golds, Best of Show and Judge’s Choice of best overall. But let me back up to explain how we chose which wines to medal to begin with, and then I’ll return to our judging and sweepstakes. For nine judges it was decided that we would begin with three panels of three. Within those panels we would select a leader and a note taker. Wines were served to us in “flights” with corresponding sheets that read titles such as Domestic Merlot, Spanish Reds or Wine Made From Fruit – no price points were given. On these sheets each wine was given a four-digit number instead of a name that corresponded with a number written on each glass. We would do one or more flights at a time, as some flights only had less than six or so wines while others had nearly a dozen. Every judge is different in how they then proceed. Most will sniff each one in the flight and then go back to the start for a sample, spit and make some notes. I didn’t feel confident in being able to recall a sample 12 or so glasses before so I opted to do each at once: sniff, swirl, sniff again, note what I liked in the aroma, sample, hold in my mouth long enough to get the general gist of the wine, expectorate, make some slight notes and select a medal. Anything less than 80 would be a “no medal” wine and usually had a fatal flaw. After your panel is done with the flight they then, each taking a turn to start, announce the medal. You may have three people that completely agree, or as is most often the case, don’t. So while I may say Silver minus (which borders on Bronze) the other panelists may say Silver plus and Gold. In one panel the person with the highest medal would then try to convince the others to raise their scores based on the merits they found. Roger Bohmrich MW, one of the judges, puts it this way: “With a panel of qualified tasters, it’s somewhat rare to have one judge say Gold and another No Medal, though it can happen. The more common challenge is to decide whether to elevate a Silver plus into Gold territory.” On another panel the three scores were just averaged out and a numerical score was calculated. (We were rotated to a different panel halfway through.) Most times, in either instance we would taste again. Have I lost you yet? LOL. Hang in there. In sweeps all of the wine judges would have an opportunity to sample all of the wines we had nominated for Gold medals. We would then note our favorites, and by a showing of hands, decide which the majority agreed would be awarded with Double Golds and then narrow down again to award, which were Best of Show. Instead of breaking into our panels we sit together for sweeps. Stay tuned, the next time I write about the Global Wine Awards I hope to be able to disclose the medal winners! LAS VEGAS, NV – Graeme Cruickshank, Master Distiller at Aberlour Distillery becomes Master Distiller of the Year for crafting the Whisky of the Year 2018 and will receive the coveted Golden Barrel Trophy. The International Whisky Competition just released its results for this year’s most respected blind tasting judging event. The top recognition, Whisky of the Year, was awarded to Aberlour A’Bunadh (60.5% ABV) which scored 97.4 points, the highest scoring whisky of the competition. The 9th edition of the International Whisky Competition took place in Las Vegas over three days, from May 15 to 17 and received whiskies from the world over. A world-class tasting panel made of whisky, spirit, beer and wine experts blind tasted each whisky on an individual basis (8 minutes per whisky). Each whisky was scored using a comprehensive 100-point scale system developed by Sebastien Gavillet, IWC Head of Tasting Panel. 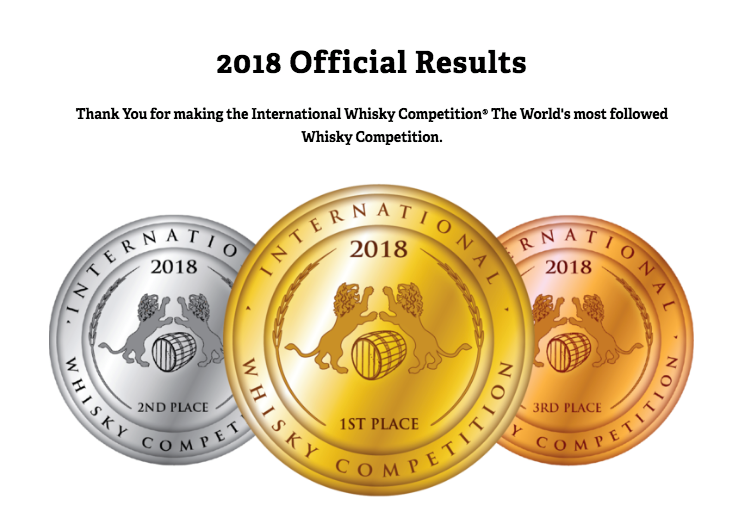 This process and the fact that only three medals are awarded in any category make the International Whisky Competition the most followed whisky competition and one of the most professional competitions of its kind in the world. We warmly congratulate Graeme Cruickshank, Master Distiller at Aberlour, as well as his team, for creating such a complex, rich and perfectly balanced whisky. Aberlour Distillery will receive the Golden Barrel Trophy for winning the Whisky of the Year during a ceremony to be held this summer in Aberlour, Scotland. The International Whisky Competition is the most followed Whisky Competition on Social Media and brings whiskies from around the world to be blind tasted and rated by a professional tasting panel using the most comprehensive tasting method available. 15 criteria are required to produce the tasting notes as well as aroma and flavor profiles for the International Whisky Guide. Unlike other competitions, the judges are presented with one whisky at a time, to ensure each whisky gets the proper attention. It’s the only competition in the spirits world to deliver unique medals designed to promote each of the winning whiskies. Only 3 medals (Gold, Silver & Bronze) are awarded per category. The Whisky of the Year (highest score during the competition) gets rewarded with the Golden Barrel Trophy.